Christmas is the most expected universal festival and has special significance in everyone’s life. It is the best time to spend with family, friends and celebrate the birth of Christ to convey his message of love, tolerance and brotherhood. Christmas tree plays a very important role this season. 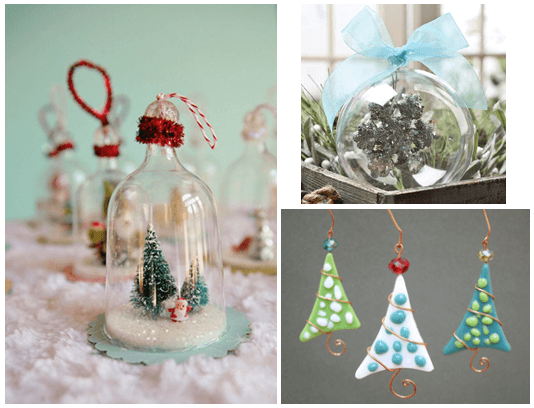 Hang these unique ornaments to decorate each layer of your tree and make it look more elegant. Ornaments have become an essential part of Christmas tree. Decorating with ornaments adds timeless beauty to the tree. Hand blown glass ornaments are unique and dazzles when they catch up light. Decorate with the vintage clear hand blown violin instrument and the Disney cindrella blown glass figurine to give a graceful look to the tree. Dress up every layer of your tree to make it look magical. Add variety of ornamental decors to make it stand out in style. Just give rustic look by hanging these amazing jute balls, stars, twigs and also the Christmas bell decorated enough to catch everyone’s eyes. Everyone has a strange love for gold. The color and finish makes it more attractive and addictive to the metal. Gold plated Christmas ornament gives the same kind of attraction for your tree décor. 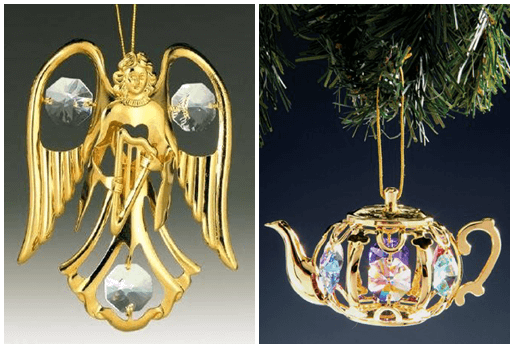 Try these Swarorski crystal 24K gold plated teapot and angel with harp ornaments to make the tree livelier than ever. 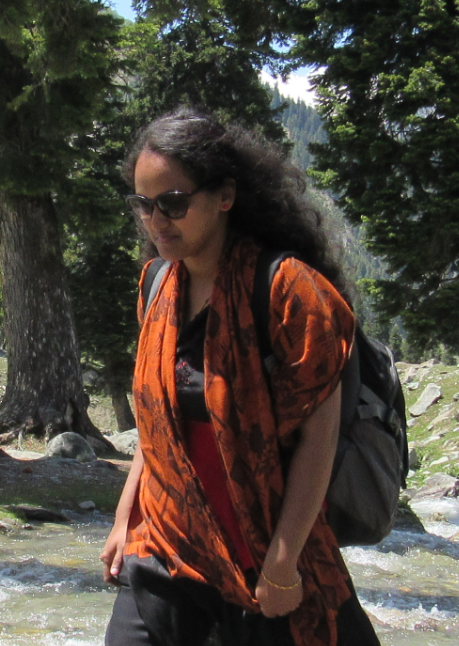 Pearl and shell are natures loveliest surprises. Ornaments made from pearl and shell looks brighter and gives a natural glow to your Christmas tree. Hang this flawless Christmas pearl bauble and the shell bucket hanging ornaments to adorn your Christmas tree. 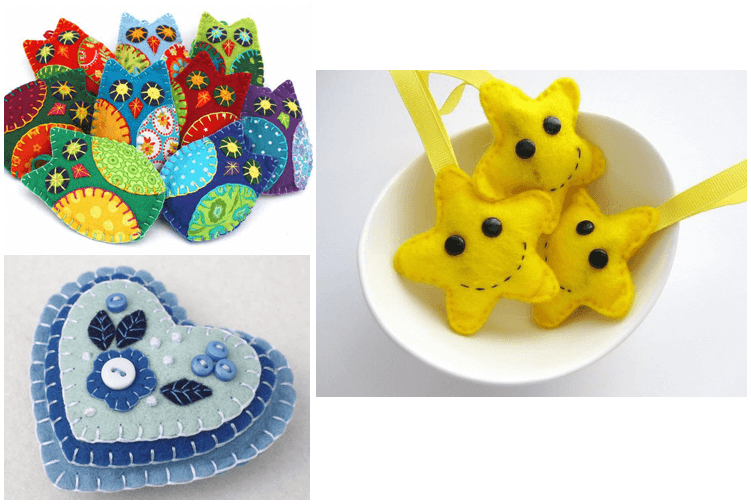 Felt ornaments are always colorful and adorable when put on trees. 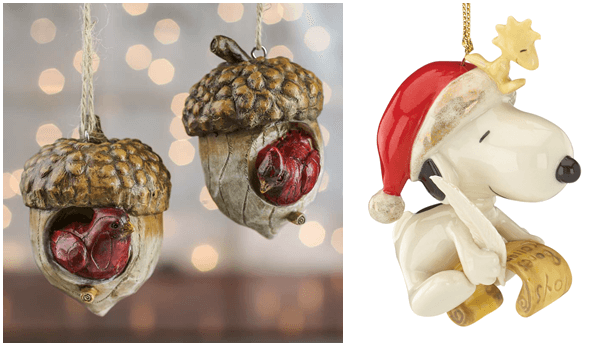 These are mostly handmade ornaments and very unique and creative in its own way. Skip the traditional red, green and jump into this bright yellow smiling face star ornament. Try these popular patch work owls and blueish white heart floral ornament to splash up with colors. Wooden carving artistic effects is always incomparable. Anything made of wood is classy and makes a perfect gift for any occasion. Never miss to decorate your Christmas tree with wooden ornaments for this Christmas. Go retro with this welcoming wooden Santa ornament and the evergreen choice of kids – the vintage mickey mouse engineer wood train to increase the charm of your Christmas tree. Ornaments can be of any size, shape, color, texture but must be bright and attractive to add astonishing beauty to the tree. Add these lovely collections of snoopy’s list to Santa figurine, bottled Christmas ornament, hanging bird house, fused glass polka dot ornaments and specially the acrylic fillable ball ornament which can be decorated by filling anything depending on your creativity. Decorating Christmas tree is a tradition followed for generations. It attracts people to unite on this beautiful day to celebrate the occasion. Decorate your tree with these unique sparkling Christmas ornaments and watch them pop up with colors giving a flattering look to the Christmas tree. If you come across any unique colorful ornament, do send it to us so we can add it to our list.